I was contacted by the new owner of a property in Hartlebury who needed help renovating a Quarry tiled floor in their dining room. 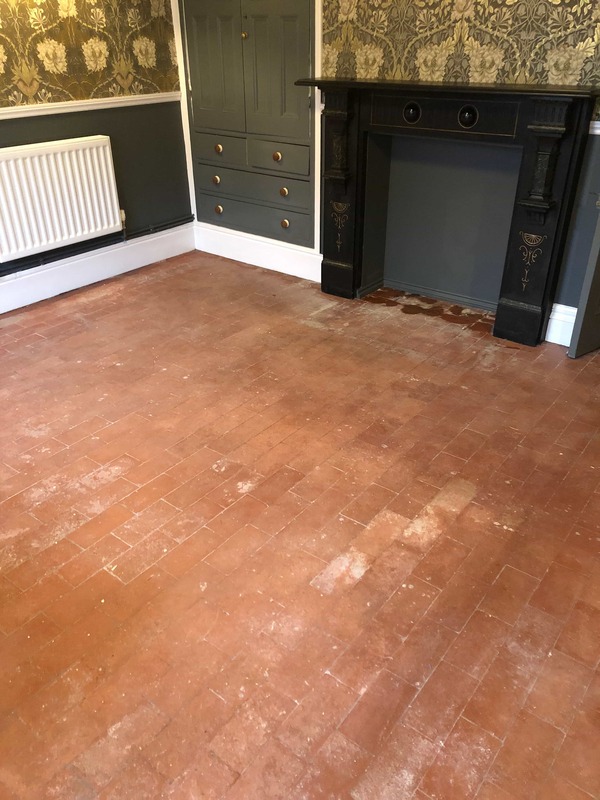 The house was full of original period features however the Quarry tiles had experienced a lot of wear over the years and were now in need of a deep clean and seal. Hartlebury by the way is a lovely village close to the larger town of Kidderminster and famous for Hartlebury Castle which was built in the mid-13th century. There were a few tiles which had experienced salt damage in the past and I explained that as a Tile Doctor I could change these tiles for her to give the best finish. The customer however, decided she would like to keep the original floor without changing the tiles and just concentrate on the clean and seal. I conducted a test clean on part of the floor to demonstrate the difference we could achieve and also work out the best products for the floor. The test went well and happy with the results my quote was accepted, and the work scheduled. I have mentioned this before but it’s worth pointing out again that damp proof membranes did not become common until the 1970’s. Properties built before then were subject to damp rising through the sub floor drawn up by evaporation at the floor surface. Alkaline salt deposits would also be brought up with the moisture and leave a white deposit on the surface of the tile. This process is commonly known as efflorescence and can cause damage to tiles which are coated with a non-breathable coating. In extreme circumstances where the whole floor is trapping moisture under the surface then it can spread outwards into the walls leading to rising damp. My first step was to concentrate on the edges of the floor using a wire brush and Tile Doctor Remove and Go on the difficult areas and paint marks. I then sprayed the rest of the floor with some more Tile Doctor Remove and Go and left it to dwell for ten minutes. Once the dirt had started to lift, I used my rotary scrubber with a black pad and worked the solution in. The soiled product was then rinsed off the floor with water and vacuumed away using a wet vacuum. The next step was to remove the white efflorescence from the surface of the Quarry tiles and neutralise any alkaline salts within the tile. The best way to do this is to give the floor an acid wash. I use Tile Doctor Acid Gel for this purpose and being a Gel it’s very easy to control. Again, the product is worked into the floor using a rotary machine and black pad. The floor was then rinsed thoroughly and then vacuumed to remove all the soil and as much moisture as possible. After I had finished the floor looked much brighter. Once I was happy the floor was clean and any trace of efflorescence removed, I finished for the day and left the floor to dry out fully overnight. I arranged to return the following day to seal the tiles. 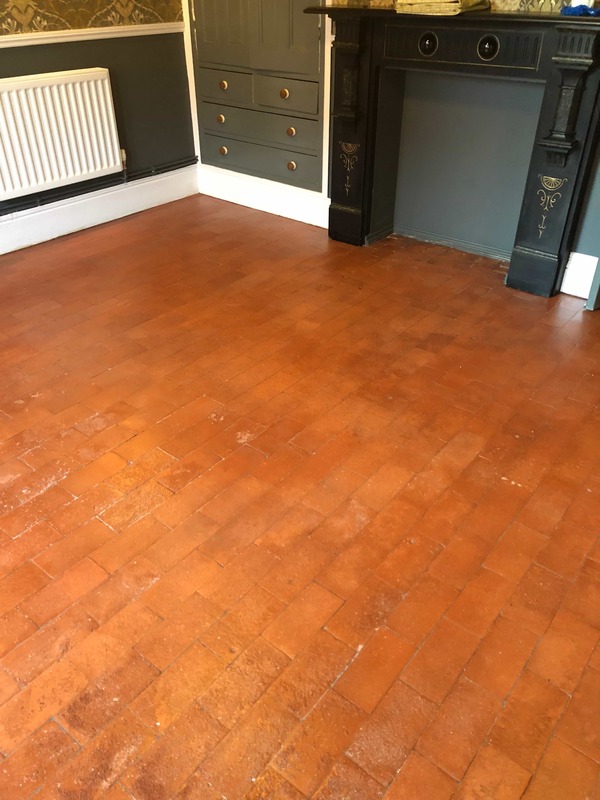 The customer had requested a gloss finish however the inherent damp issues meant I would need to apply a fully breathable sealer that would allow moisture to rise thorough the Quarry tiles unimpeded. The solution was to apply Tile Doctor Seal and Go Extra, this a semi-gloss topical sealer which is fully breathable. This sealant leaves a beautiful finish and allows the natural colour of the tiles to shine through. After using my damp test meter and making sure the floor was fully dry, I started the sealing process. The Quarry tiles were treated to five coats and the customer was very pleased and left some great feedback which I’ve copied below. Although we didn’t replace the damaged tiles, they were much improved and added character to the floor. Also, the new sealer will make them much easier for the customer to keep clean. For aftercare I recommended the use of Tile Doctor Neutral Tile Cleaner to keep the floor looking pristine, unlike harsher products you find in supermarkets it won’t damage the sealer prematurely. 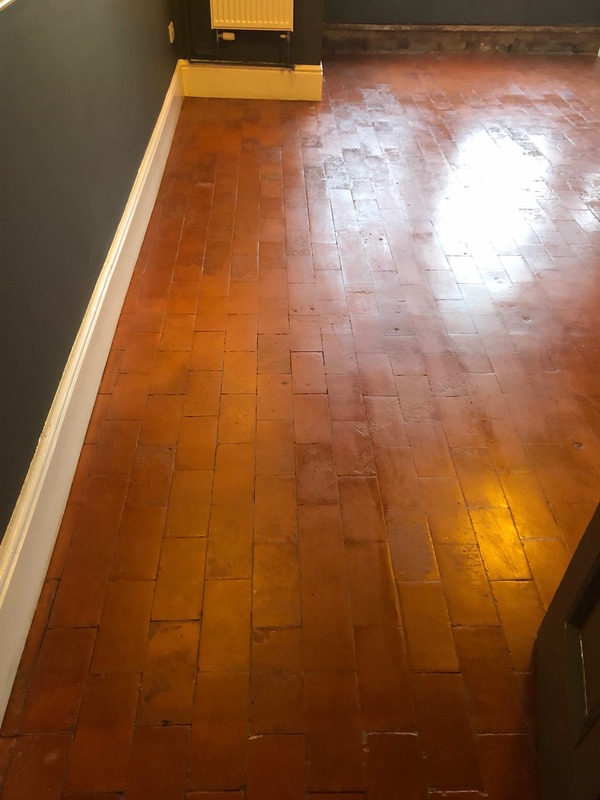 This entry was posted in Dining Room Floor, efflorescence, Hartlebury, quarry tiles, renovation, Rising Damp, Salt Damage, Tile Cleaning Activities, Tile Replacement, worcestershire, Work History by TileProf. Bookmark the permalink.